I was talking to a friend of mine the other day about stock or bouillon as we call it in Russian (I know, pinched it from the French) and she said she really fancied some rich salty dark bouillon, but how would she make it? She wondered if one would make it from chicken, chicken bones? beef? how? I realised that to explain it all starting from the beginning would be like giving a crash course in everything I learned about stock making during the last 30 years (assuming I didn’t partake in stock making until the age of 10, a conservative estimate). There are loads of great articles about making gelatine rich and flavoursome stock, but here is a user friendly version that doesn’t involve going to your farmer and asking for “bones, heart, kidneys and fat, when you slaughter” and being perceived like a local witch (but still getting a box of goodies for next to nothing ). It only requires a quick trip to your reasonably sized supermarket or your butcher. 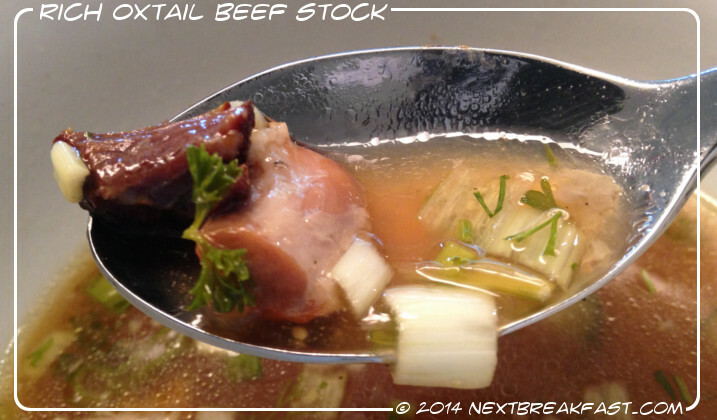 Let’s do ox-tail broth! Ox-tail is a great cut, it has bones, it has ligaments for gelatine and it has enough meat too for flavour and to add to your soup afterwards. 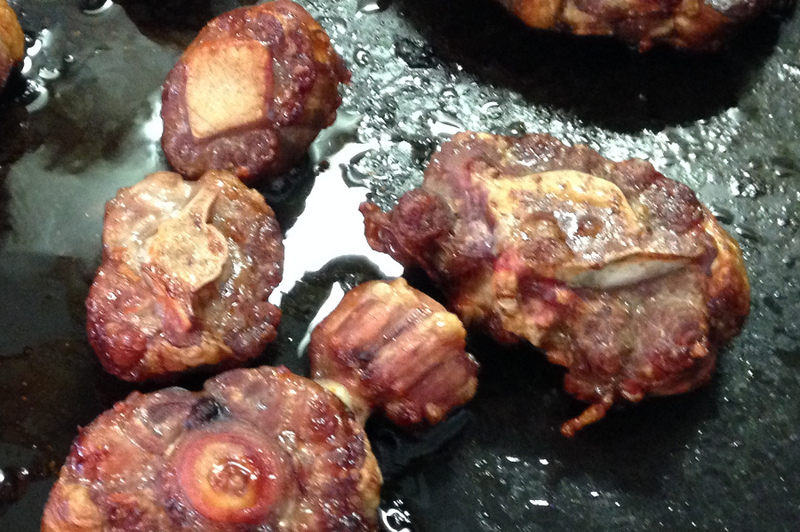 Roast oxtail in 180°C oven until nicely browned and sizzling. 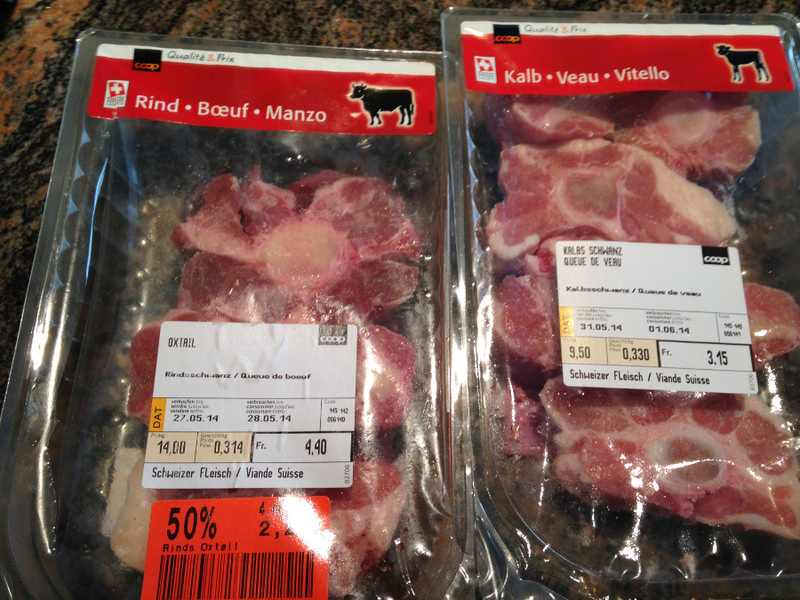 Get a big stockpot , mine is about 5 litres, add roasted oxtail, a carrot or two, cut in half or any way you like. A couple of stalks of celery and an onion, cut in half. If you leave some of the skin on the onion, it will contribute to the colour of the stock. I also add peppercorns and a bay leaf. Some people in our family cut vegetables into tiny pieces but then I find it difficult to strain and take the pieces out. 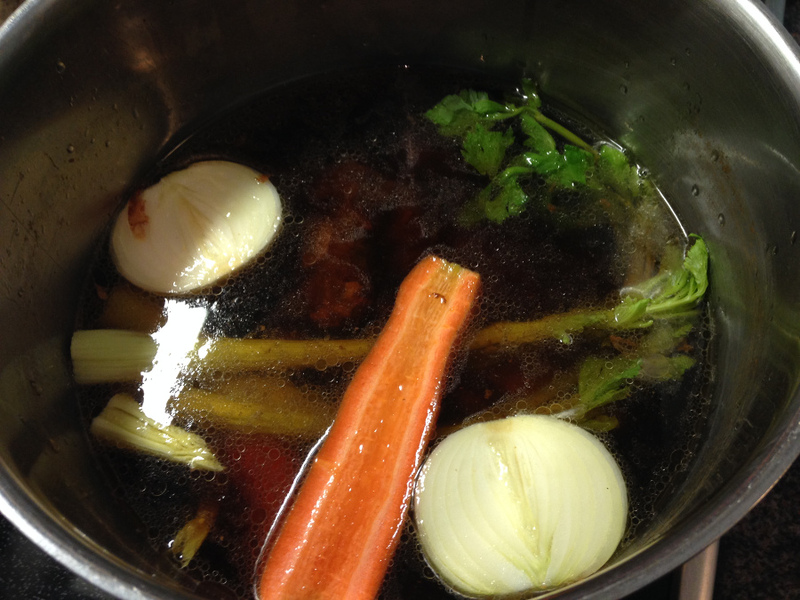 I think enough vegetable minerals and flavour get into the stock after 48 hours even from big pieces. Also I find if onion is cut into small pieces, the stock can taste too much like onion soup and I don’t always want that. Bring your stock to gentle boil, skim any foam, reduce the heat to low, so that there is only an occasional bubble but no boiling. Cook for at least 24 hours, up to 48 or even 72 hours. I normally do 24-36 hours. Cool, strain, separate the meat from the oxtail pieces. Now you have several options. 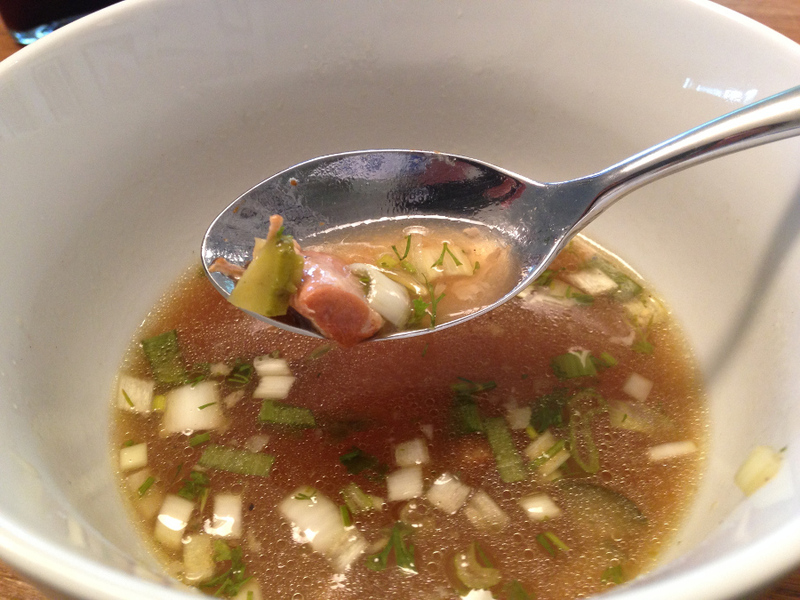 3. put meat into stock, add spring onions, gherkins, garlic, dill and eat! 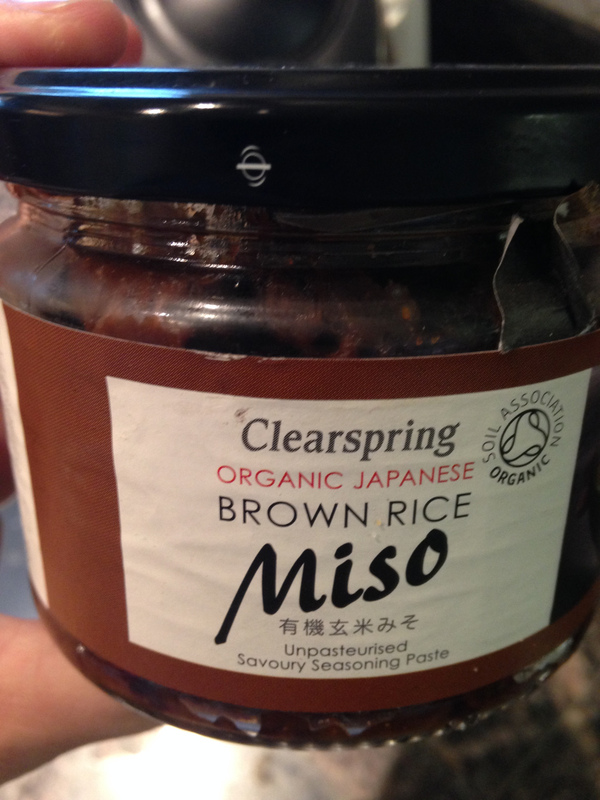 4. put meat into stock, add miso paste and spring onions and whatever else you fancy and enjoy a nourishing miso soup. 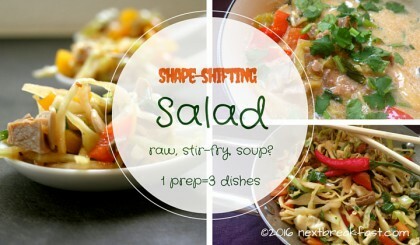 As for why make your own broth apart from the taste? Recent research has shown that there is little calcium in bone broth, but what’s healing and good for us in the broth is the collagen and gelatine, it is anti-inflammatory and bone building. While it’s fortunate that modern science supports bone building with food-based collagen hydrolysate and gelatin products (sources) — and these can be useful adjuncts to a real foods diet — the better–and tastier–solution is still daily bowls of nourishing broth. 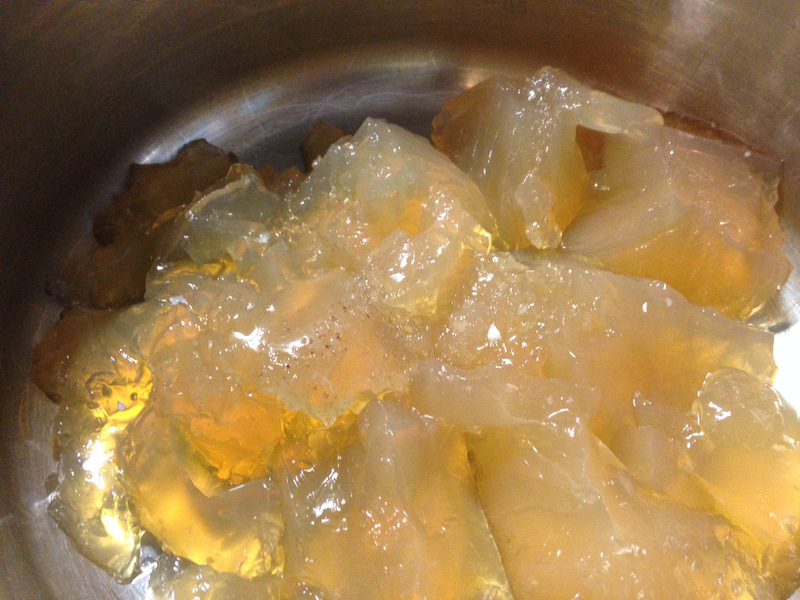 The gelatin found in bone broth is a hydrophilic colloid. 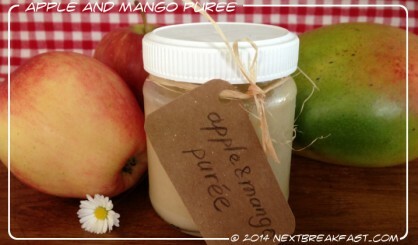 It attracts and holds liquids, including digestive juices, thereby supporting proper digestion. Reduces joint pain and inflammation. Thanks so much for this wonderful post and pics ! Love all the information! When are my bones finally coming?